Who cares if Android 4.4 aka Kit Kat is just around the corner? Most users on stock firmware are still waiting to get updated to Android 4.3. Samsung made sure that the Galaxy Note 3 would launch with Android 4.3, but so far the Galaxy Note 2 and Galaxy S4 are still on 4.1.2 and 4.2, respectively. 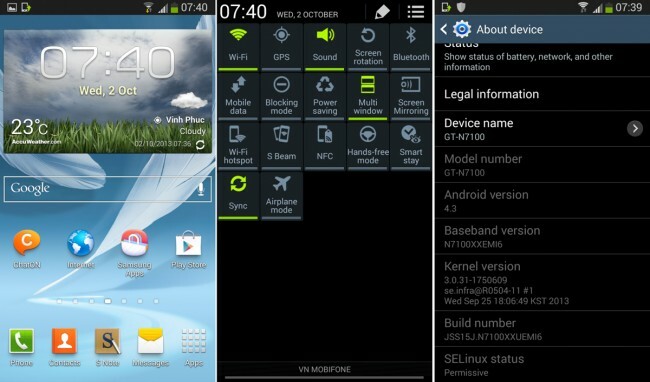 Although today, a leaked build of Android 4.3 for both phones have been released for those adventurous Galaxy owners that don’t mind flashing sketchy firmware builds. According to SamMobile, Samsung just started testing 4.3 on the older Note 2 and newer Galaxy S4 last week, but this is the third build of 4.3 already. Reports say that the UI that Samsung has moved towards with the Galaxy S4 and Note 3 have made it into this new version of Android. Traces of Samsung Knox and Samsung Wallet are also present in this build, but beware, this is not for the everyday flasher. This is still a very early build of Android 4.3, so installers should be wary of bugs that still need to be worked out. If you are feeling froggy, head to the link below for download and instructions on installation.